Leg 1: Start in Bulverde, TX which is a town just about 30 miles due north of San Antonio. My first stop was for fuel at Hwy 1863 and US Hwy 281. I headed east on 1863 (2-Lane), which merges with Hwy 46 (4-Lane). Pay attention to the road signs as Hwy 46 will turn left after an underpass (If you've reached I-35, you've passed it). As you continue on Hwy 46, you will exit Rock St. and turn left at the sign to the Gruene Historical District. This road will take you to the center of Gruene. Leg 2: From Gruene, I took Hwy 306 northwest, which takes you around Canyon Lake, until I got to Hwy 484 (N), which takes you to Hwy 32 and head west to Hwy 281, just outside of Blanco. Once in Blanco, turn left on Hwy 1623, which leads to Hwy 1888 and follow it until it ends at Hwy 1376 and make a right. You will pass Luckenback and continue on until you get to Hwy 290, where you will make a left and head into Fredericksburg. At this point, I had a couple of brews with my wife (who met me there) at the Fredericksburg Brewery (which has fine food as well) and we spent the night at a Motel 8 down Main St. since by then, darkness was falling. Leg 3: From Fredericksburg, I took Hwy 16 through Kerrville, through Medina, and into Bandera. This is one of the most beautiful stretches of roads on this trip, with lots of hills, orchards, ponds, and lots of twisty turns and cut-backs. I stayed on Hwy 16 through Bandera, where I headed back towards San Antonio, and took Hwy 46 back home and concluded one of the most enjoyable weekend trips I ever had in Texas. I definitely plan on doing this trip again. Beautiful! Plenty of scenic countryside, farmland, rivers, ponds, orchards/trees, rolling hills, twisty turns and cutbacks (especially between Kerrville and Bandera). Some straight-aways allow you to safely open up the throttle and best of all, not too much traffic throughout the entire ride. Gruene, Lukenbach, Fredericksburg, Kerrville, and Bandera are exceptional stops for travelers with lots of amenities at each - including shops, country stores, dancehalls, museums, and even a biker's resort (Koyote Ranch), which we passed en route between Kerrville and Bandera. Bring a camera. Between stops of Gruene, Fredericksburg, Kerrville, and Bandera there are plenty of gas stations for fuel, food, and rest stops. Gruene and Fredericksburg have superb historical districts with excellent sights, restaurants, shops, country stores, B&B's, and overall rustic charm. You can't go wrong at these places, and you will be pleasantly surprised to find a lot of biker-friendly people there. Places of interest in Gruene: Gristmill Restaurant by the river, Gruene Dance Hall, Bubba's Big Deck (Cool, friendly Biker Hangout by the Guadalupe River- with food, beer, and biker-friendly people), and countless country stores, B&B's, and rustic antique shops. You can easily spend an entire enjoyable day there. Places of interest in Fredericksburg: Lots of shops, museums (Admiral Nimitz Museum), B&B's and restaurants. The surrounding area has several charming roadside farmer's markets and country stores, as well as authentic German restaurants. You'll find lots of traveling bikers there. It's easy to want to spend the night there after a good days ride, and the lodging prices are reasonable. on February 25, 2013 2 out of 2 members found this review useful. The portion of this route that connects Medina and Bandera (via State Hwy 16) is particularly great. Strap yourself in for 16 miles of genorously high speed WIDE turns leaning on the edge of your tires for 10-20 seconds both sides. Prepare yourself (man up) for a blind turn strting high left dipping quickly low and right into a section allowing you to get back on the throttle. 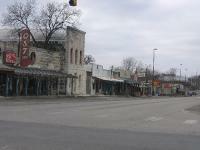 All in all these are great roads, business, residential backed by the most beautiful scenery Hill Country has to offer. on March 23, 2010 1 out of 1 members found this review useful. This is the ride in Texas everyone remembers most. You have to ride 3 twisted sisters for the ultimate experience. Nice biker (bar) stop outside of Leakey... get a 3 sisters patch while you're there. BJ's cafe in Camp Wood have consistently good comfort food and a laid back atmosphere. Loved the countryside and the views from up high. on September 15, 2017 0 out of 0 members found this review useful. on January 25, 2009 0 out of 0 members found this review useful. on January 12, 2009 0 out of 0 members found this review useful. That is a great ride, about 200.0 miles for the trip. That's a nice day ride for sight seeing. I agree we need maps. on September 3, 2008 0 out of 0 members found this review useful. Looks like a nice ride, but needs a Google Map like some of the other rides on this site.